The next coin in the early commemorative series is one of the more historically odd. Struck in 1924, the Huguenot-Walloon Tercentenary Half Dollar commemorates the 300th year anniversary of the settlement of New Netherland by Walloons, French and Belgian Huguenots. While the 1624 settlement was important as it was the first Dutch attempt at colonization in larger form (30 families sailed to America that year) and necessary after New Netherland had become a far-away province of the Dutch Republic earlier that year, it was nowhere near the first exploration of the area by the Dutch. Henry Hudson had visited the area in 1609, and the colony was first established in 1614, when a small fort was built near present-day Albany. The next year another fort was built on an island that was called “Manna-hata” (later anglicized into “Manhattan”) by the Native Americans of the area, and it would be this fort and surroundings that would grow into New Amsterdam, and later New York City. That said, 1624 certainly was an important year for New Netherland, one that perhaps did suffice a commemorative half dollar being issued, even though other years might have served the purpose better. The coins were distributed by the Huguenot-Walloon New Netherland Commission, who like other commissions of the period saw the dollar signs in their eyes when a commemorative half dollar was considered. Interestingly enough, the commission was led by Rev. Dr. John Baer Stoudt, who was associated with the Federal Council of Churches of Christ in America, which led to protests as some believed the issuance of a coin related to a church group was a violation of the First Amendment of the Constitution, as Church and State were no longer separated. In the end, such protests ceased and seem to have been forgotten in history. Perhaps the most incorrect or at the minimum “odd” part of this commemorative can be found in the design elements, especially the obverse. It features the conjoined bust of Admiral Gaspard de Coligny and William the Silent, both important figures of the 16th Century. Both had been dead for decades when Hudson first sailed to what would become New-Netherland, and obviously played no part in the settlement of the Americas. De Coligny was of French descent and is best remembered as a Huguenot leader who did play a role in the settlement of French colonies in what is now Brazil and Florida, but any relationships to the families that sailed to New-Netherland in 1624 ends there. William the Silent (also known as William I, Prince of Orange and the forefather of the Dutch royalty to this day) was the first Stadhouder (literally “place holder”, a Dutch position as head of state that originated in medieval times) of the Dutch Republic. He was assassinated in 1584 and did not play any role in the Dutch settlements of the Americas either. Besides these two unrelated persons on the obverse there is UNITED STATES OF AMERICA on top, IN GOD WE TRUST on the right side, the names COLIGNY and WILLIAM THE SILENT below the busts and the denomination, as HUGUENOT HALF DOLLAR. 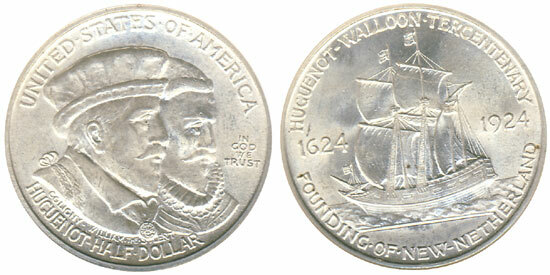 The reverse features the words HUGUENOT-WALLOON TERCENTENARY, the dates 1624 & 1924, and the words FOUNDING OF NEW NETHERLAND. The main design element is the Nieuw Nederland (Dutch for “New Netherland), the ship on which the 30 families sailed to North-America in 1624. The image perhaps is one of the most striking depictions of a ship on American coinage, with all of its sails set, and three waving flags on top. Little is known about the actual ship, and the ship depicted seems to have been largely based on the imagination of George T. Morgan (who prepared models for the coin) and James Earle Fraser (who modified the design). Most of the people that sailed on the Nieuw Nederland were not Dutch, but from areas further south, in modern-day Belgium and Northern-France. They had come to the Netherlands to escape religious prosecution, much like the Pilgrims a few years before. The ship had left the Republic in late March, and arrived sometime around late May, settling near Fort Orange (which later became Albany) and on present-day Governor’s island. Many of these families did not speak Dutch but French, and they were joined by enslaved Africans, as well as more families the next year (most of which actually were Dutch). Early on it created a mix of cultures and languages, a unique aspect of the colony, something which still lives on in New York City and surroundings to this day and is one of the most well-known features of the Dutch Colony. One interesting aspect of the Dutch colony is that despite the fact that these early settlers were Huguenots and Walloons that were on the run for persecutions, this was not the main reason for their settlement in the Americas. They were enlisted by the Dutch West India Company which had been incorporated in 1621. Set-up in a similar manner as the Dutch East India Company (the first corporation in the world), the company was instrumental in Dutch settlement of the Americas, including New Netherlands and later Dutch possessions in the Caribbean. Settlement of New Netherland was a direct result of the creation of this company, making it the only American colony which was founded as a business venture. Congress had authorized a total of 300,000 of the Huguenot Walloon Tercentenary Half Dollars in February 1923, but the actual mintage was lower, with a total of 142,080 struck at the Philadelphia Mint. Of this number it is believed that 87,000 were sold for $1 apiece, but it remains unclear what happened to the rest. Q. David Bowers, in his Guide Book of Commemorative coins mentions that reportedly 55,000 were released into circulation, but given the fact that relatively few worn pieces are known this seems unlikely. Regardless of what happened to these coins the issue is generally available in uncirculated condition up to the gem level, although anything finer is rare. Most pieces that are in the marketplace are quite appealing, although some dipped and cleaned coins also exist, and coins with excessive marks are occasionally encountered as well. Very interesting article. The use of Coligny and William certainly is odd. One small nit: paragraph five, second sentence begins “They had come to the Netherlands to escape religious prosecution, …” should be “… religious persecution, ..” shouldn’t it? While a fine pun, the prosecution would be for a crime, not for a religious. Wouldn’t “religious prosecution” be prosecuting (Catholic) religious, that is, nuns and brothers, in an area where the Roman church was banned?